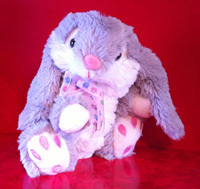 A beautiful soft cute cuddly grey and white bunny rabbit with floppy big ears. 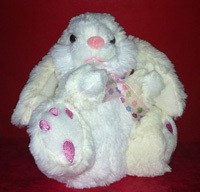 A beautiful soft cute cuddly cream and white bunny rabbit with floppy big ears. 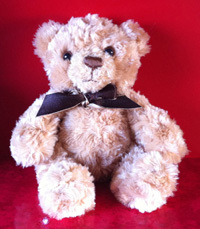 A beautiful traditional cute brown bear that is soft and cuddly. 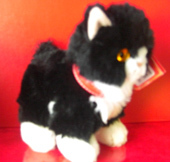 Beautiful hand made black and white soft toy cat, with a red collar. 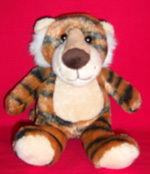 Cuddly cute tiger soft toy that makes tiger growl when squeezed. Cuddly cute Orangutan soft toy. Brown fur with brown hands and feet. 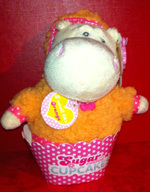 Soft cute hipo in sitting in a Cupcake container. 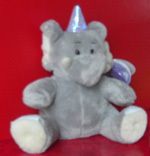 Cute grey and white cuddly elephant. 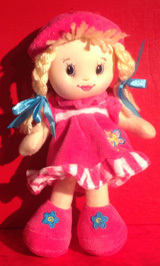 A coulourful soft cute rag doll with blond pig tails. Cuddly cute monkey soft toy. Black fur with brown hands and feet. 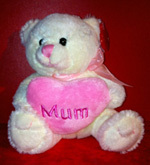 A beautiful cuddly white bear with a pink ribbon and large heart shaped cushion with the words Mum on it. Perfect for mother’s day or a birthday. The price includes delivery. If you order this gift and a card we will send them together.